The 2018 edition of NFPA 12 provides the latest in carbon dioxide fire extinguishing systems for safe and efficient design, installation, and maintenance. 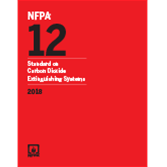 Up-to-date with code references in NFPA 3 and NFPA 4, the 2018 edition of NFPA 12: Standard on Carbon Dioxide Extinguishing Systems presents the latest consensus-based rules for the installation and maintenance of CO2 extinguishing systems. Coverage in NFPA 12 addresses total flooding systems, local application systems, hand hose line systems, standpipe systems, and mobile supplies for the full range of systems used for industrial and marine fire protection. Interested in other editions of NFPA 12? Use the drop down menu above to select the edition year you need. 4.1 Restrictions for Normally Occupied Enclosures. 4.2 Carbon Dioxide Use and Limitations. 4.4 Specifications, Plans, and Approvals. 4.5 Detection, Actuation, and Control. 4.8 Inspection, Maintenance, and Instruction. 5.3 Carbon Dioxide Requirements for Surface Fires. 5.4 Carbon Dioxide Requirements for Deep-Seated Fires. The 2015 NFPA 12 provides the latest in carbon dioxide fire extinguishing systems for safe and efficient design, installation, and maintenance. Up-to-date with code references and new information in NFPA 3 on commissioning, the 2015 NFPA 12: Standard on Carbon Dioxide Extinguishing Systems presents today's consensus-based rules for the installation and maintenance of CO2 extinguishing systems. Coverage in NFPA 12 addresses total flooding systems, local application systems, hand hose line systems, standpipe systems, and mobile supplies for the full range of systems used for industrial and marine fire protection.